This new notebook style, interactive series for girls of the over 6 age group, is full of fun and attractive in appearance and presentation. Harriet invites girls to draw in her Secret Notebook #1, share ideas and responses to thoughts and problems through entries, and create illustrations to put into the spaces left for the reader’s participation. The notebook is full of colourful and creative drawings, lots of swirly images and colours, outrageous costumes, (even on the dog) and fluffy language that’s full of the kind of funny and exaggerated repetition that girlfriends use between one another. 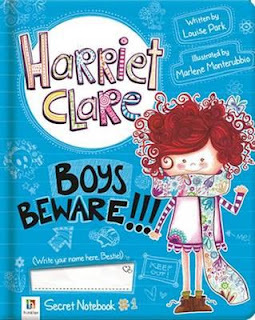 Harriet has broken up with her bestie Indie over an issue of her clumsiness, and she’s looking for a new BFF, but at the same time would love to get back with Indie. An opportunity arises. Indie’s birthday is coming up and Harriet seriously wants to buy her something that she really wants and will like. Perhaps this way, her former BFF will reconsider their relationship. Ideas are encouraged from the reader. Harriet is a keen skateboarder. A competition is coming up and the prize money will secure Indie’s present. Boys better beware as Harriet is determined to win. There has been an influx of these diary/notebook style books for girls recently. They vary in quality of content but it’s often said that if a child is reading words, that’s better than not reading at all. This is an ideal book for difficult readers and is visually attractive with its bold covers, creative illustrations, and interactive options.